The number of spots on the Sun increased significantly during April 2002. A dozen or more sunspot groups crossed the Earth-facing side of our star and some of them produced strong solar flares. Sunspots are cool, planet-sized areas on the Sun where intense magnetic loops poke through the star's visible surface. Twisted magnetic fields -- stretched like taut rubber bands -- can snap back and explode, powering solar flares and coronal mass ejections. These [gradual Earth-change activities in 1998] are at the periods when the cycle of the solar activity, or the years as related to the Sun's passage through the various spheres of activity become paramount ....to the change between the Piscean and the Aquarian age. This is a gradual, not a cataclysmic activity in the experience of the Earth in this period. The word paramount implies "one superior to all others with which we are familiar." Now let's turn to the latest information on the progression of the current solar cycle to see if there is any evidence that it may become paramount. J. Alvestad's latest graph, of sunspot frequencies for solar cycles 2, 10, 13, 17, 20, and 23 (shown below) shows high promise that cycle 23 may indeed be becoming paramount. Fig. 1 - A Graphical Comparison of Solar Cycles 2, 10, 13, 17, 20 and 23, Through April 2002. Solar cycles 2, 10, 13, 17 and 20 are those that most easily compare to the development of cycle 23, particularly cycles 17 and 20. The chart displays the development of all these cycles during their first six years. The X axis in the chart is the number of months from the start of a cycle, while the Y axis is the international monthly smoothed sunspot number. Here we see that the red line for cycle 23 is not turning downward, as was the case for similar solar cycles at this point in the past. It is, in fact, turning upward. NASA solar scientists think that this is little more than the beginning of the formation of a double-peaked solar cycle, which they say is not all that unusual. We might think differently, however, because Cayce's reading predicted a paramount cycle for this transition period between the Piscean and Aquarian astrological cycles. Time will soon tell if cycle 23 is something special. Meanwhile, according to NASA's David Hathaway, "Solar Max," eleven years ago, was much the same as the present cycle. "A first peak arrived in mid-1989 followed by a smaller maximum in early 1991," he says. Hathaway thinks that if the ongoing cycle proves to be a double, it will be the third such double-peaked cycle in a row. But Alvestad's analysis of cycles 21, 22, and 23 does not agree with Hathaway's assertion. In Alvestad's graph (Figure 2, below), which is based on smoothed data for monthly sunspot numbers, we see something different. Alvestad's analysis is completely out of harmony with Hathaway's statement about the two previous solar cycles being double peaked. And the upward slope of the second peak of cycle 23 that is developing seems not to portend a peak smaller than the first. Fig. 2 - A Graphical Comparison of Solar Cycles 21, 22 and 23, Through April 2002. Solar cycle 23 was originally predicted to reach the same magnitude as cycle 21, with the monthly smoothed sunspot number reaching 160. Cycle 23 first peaked at 120.8 in April 2000. Alvestad says that cycle 22 is not a good comparison due to the unusually short time it took to reach its maximum. Other cycles compare better to the development of cycle 23. (See Fig. 1). The X axis in the chart is the number of months since the cycle started, while the Y axis is the monthly smoothed sunspot number. Sunspots are the most visible sign of complex magnetic fields -- but not the only one. Another sign is solar radio emissions, which come from hot gas trapped in magnetic loops. " The radio Sun is even brighter now than it was in 2000," says Hathaway. "By the radio standard, this second peak is larger than the first." This statement seems to us like more evidence of a developing paramount solar cycle. Hathaway also notes a widespread misconception that "solar activity varies every 11 years like a pure sinusoid." In fact, he says, “solar activity is chaotic; there is more than one period.” Earth-directed solar explosions, for instance, tend to happen every 27 days -- the time it takes for sunspots to rotate once around the Sun. There is also an occasional 155-day cycle of solar flares. No one knows what causes it. And the double peaks of recent solar maxima are separated by approximately 18 months. But reading 1602-3 says that we are due for a "paramount" solar cycle, implying that it will be even larger than the previous two cycles. .... the sun , the moon, the planets have their marching orders from the divine, and they move in same. Man alone is given that birthright of free will. He alone may defy his God! How many of you have questioned that in thine own heart, and know that thy disobedience in the Earth reflects unto the heavenly hosts and thus influences that activity of God's command! For YOU -- as souls and sons and daughters of God -- DEFY the living God! As the sun is made to shed light and heat upon God's children in the earth, it is then of that composition of which man is made, or that termed the earth; yet, as ye have seen and know, there is solid matter, there is liquid, there is vapor. All are one in their various stages of consciousness or of activity for what? Man -- GODLY MAN! Yet when these become as in defiance to that light which was commanded to march, to show forth the Lord's glory, His beauty, His mercy, His hope -- yea, His patience -- do ye wonder then that there become reflected upon even the face of the sun those turmoils and strifes that have been and that are the sin of man? All that was made to show to the sons, the souls, that God IS mindful of His children. How do they [sunspots] affect man? How does a cross word affect thee? How does anger, jealousy, hate, animosity, affect thee AS a son of God? If thou art the father of same, oft ye cherish same. If thou art the recipient of same from others, thy brethren, how does it affect thee? Much as that confusion which is caused upon the earth by that which appears as a sunspot. The disruptions of communications of all natures between men is what? Remember the story, the allegory if ye choose to call it such, of the tower of Babel. There are over 7,800 firms that supply electric power to U. S. customers. How much damage to the electric grid could be expected from geomagnetic storms that would accompany the peak years of a paramount solar cycle 23? The following article suggests that it might be prudent to think about how one might respond if a large solar storm were to occur over the next two to three years. (The quote below is from Earth In Space, v. 79, March 1997, © Amer. Geophysical Union). "Extensive blackouts are the nightmare of the power industry. Once power is interrupted, in large metropolitan areas, diversity of electric use on the network is lost. When power is restored, all thermostatically controlled electric loads come back on simultaneously. This stress, added to the higher demands of many devices such as motors and transformers, can draw up to 600% of normal load during restoration procedures. Such a blackout is also likely to cause transient voltage stresses and permanent damage to network equipment such as high-voltage breakers, transformers, and generation plants, which makes them unavailable for restoring power. Hours or days may pass before power can be restored......assessments have placed the 1989 and 1991 geomagnetic storm effects in a category equivalent to Hurricane Hugo and the San Francisco earthquake in their relative impact on the reliability of the electric power grid. We turn now to Phylos's vision of Nature's vengeance predicted to occur about now, at the transition from the Piscean to the Aquarian Age. Phylos The Tibetan dictated a manuscript from the other side to an amanuensis, F. S. Oliver, in the late 1890s. The resulting book, "A Dweller On Two Planets," is currently published by Borden Publishing Company in Los Angeles. (Hugh Lynn Cayce once told one of THC's subscribers that Edgar Cayce had a copy of “A Dweller on Two Planets,” and that he was familiar with its contents). Toward the end of his narrative Phylos speaks of the Great Karma to affect humankind at this time. During many, many centuries prophecy hath looked forward to the end of the Age as a time of awful woe, and has pictured dread scenes of terminal horror. Am I come to say that all these predictions shall fail? Is the book of the Apocalypse mere allegory? Would it were! But as the Poseidian age was stricken, this one must also be which has just passed. Shall America, the Glorious, together with the rest of the world, meet similar woe? Alas, worse, though not by water but by fire. Shall all be wiped out of existence, leaving the planet in ruins? Unto the end of full obedience and the coming into harmony with divine law shall the lash be applied; words may not portray the scenes. This is the Message of the End of the Age: “The day of vengeance is in mine heart, and the year of my redeemed is come nigh.” - Isaiah. “Behold, the day....that burneth as an oven.” - Malachi. "That loveless conflict will initiate that which, Nature completing, will leave living but one where now are many, for in that day none will pause to bury the slain until the evil is wrought, nor then, for the dead of the plagues will be as thousands for every one by violence. And all this because the love that should grace and soften men's hearts, each for all and all for each, dried up and became a mockery in the close of the ended cycle, leaving but scattered oases, few and far between. Nature follows man. Wherefore the waters of Earth will dry out, rains be withheld, cyclones sweep, and an earthquake come such as was not since a man was on the Earth; aye, I am mindful of Poseidia. But all of this will occur through natural causes, and in consonance with the selfishness, lust, greed, anger and general depravity of the Type. As these blaze in the human breast, so shall the air, dry and vaporless under brazen skies, develop solar heats [emphasis added] more fierce than history ever knew. A parched earth, furnace-like, piling all flesh mountains high; pestilences stalking unchecked. O ye! Blind to the Handwriting on the wall, which flickers still, though writ for a spent cycle. Turn now and read, while yet the last midnight stroke reverberates." Phylos's opening sentence in the quote above seems clearly to suggest that the loveless conflict will initiate plagues, which, Nature completing, will lead to thousands killed for everyone killed by violence. If you want to read about man's capabilities to initiate plagues I suggest that you get a copy of “Germs,” by New York Times authors Judy Miller, and Others. (Simon and Schuster published the book in 2001). It brings one up to date on the production and potential uses of everything from weaponized anthrax to genetically modified super germs, for which human beings have no immunity. The authors conclude, in part, that America remains woefully unprepared for a calamity unlike any other it has experienced. to his dependence wholly -- physically and mentally -- upon the Creative Forces .....Remember [that next time], not by water -- for it is the mother of life in the Earth -- but rather by the elements, fire. This reading seems to parallel closely Phylos's assertion above that "America, the glorious, together with the rest of the world, will meet worse woe than Atlantis, "though not by water but by fire." One assumes that "the entity" in the above passage is Phylos and that the karmic penalty enunciated by Phylos might be mitigated for America if enough of us were to do an about-face and start to implement Christ-like ideals in our activities at home and abroad. One meaning of looking only to the Lamb is that by trying to unite with that in ourselves which comes from above, we will be operating above the level of the senses where karmic destiny holds sway. What is needed most in the Earth today? That the sons of men be warned that the day of the Lord is near at hand and that those who have been and are unfaithful must meet themselves in those things which come to pass in their experience. Note here, however, that faith (pistis) in the New Testament means more than belief. It means understanding on a level other a literal one. For example, when the disciples took something said by Christ in its sensual or literal sense, Christ told them that they had little faith (Matthew 16: 5-12). The mistake of being "unfaithful" in the reading immediately above is that lack of faith leads to an inner condition that requires us to repeatedly encounter "adverse" experiences until we can understand life in a new way. Hence the necessity ....that the faith [higher understanding]....in a divinity that is WITHIN be held -- that shapes the destinies of individual experiences in such a way that the opportunities that come....are those things which if taken correctly make for the greater soul development. Most scientists and technical people do not believe in any life after death -- or reincarnation for that matter. They are examples of faithless people today. That is their Sadducee-like leaven of falsity, which Christ said to beware of in Matthew 16. Indeed, most scientists cannot countenance the concept of "soul development." All this leads us to a Cayce Earth-change reading (1152-11; 08/13/41), given for a New York City woman wondering where to live and what to do. She was a person full of faith. Here we have described for us a basis for the power of the activity of the Son of God (or "Son of Man," as Jesus spoke of himself) in the affairs of our lives today. Q What is my father's name? Q Can't you answer that question? A To be sure, it may be answered. It will not here. A Why will you not answer these questions, when I want to make sure in order to help? A He that seeketh a sign when he standeth in the presence of the Highest authority in the Way may NOT be given a sign, unless he has done in the body that which entitles him to same. However, - since the advent of the Son of Man in the Earth, giving man an advocate with the Father, there has been an influence that may counteract much of that which has been indicated that would come as retribution, or in filling the law of an evolution of ideas and the relationship of material things to the thoughts and intents of individuals and groups.....There enters much, then, that might become questions as respecting....the activities of groups and individuals who have acted and who are to act as a counterbalance to these happenings in the Earth. There are indeed questions that we might have of those "groups and individuals who have acted and who are to act as a counterbalance" to the happenings in the Earth since 1939, the date of this reading. Among them are: "Why did you allow the following to happen: WWII; the Korean and Vietnam Wars; the Gulf War of 1990; America's brutal treatment of Panamanian civilians in the 1989 'Noriega War;' the Bosnian War; the holocausts in Germany; Cambodia; and Africa; America's torching of its own citizens at Waco; and the current suffering since 9/11/2001? Did humanity suffer these horrors* because - as Phylos implies -- we are a selfish, stiff-necked, and adulterous generation, unable to change for the better without going through the fire?" If so, then perhaps we will need Earth changes to purge us of our seeking after the false gods of materialism, pleasure, and power. For we do understand that "matter, mind, body, learns only through experience.” (5148-2, 05/29/44). And many of us may need the experiences of Earth changes for our souls' growth, to show us the folly of our preoccupation with the sensual side of life. The word "supply" here may refer as much to an inability to produce enough food as it does to an inability to harvest and distribute that food. And Cayce reading 2746-2 (1943) refers to a time when "turmoils are to arise" in America and says that Norfolk, Virginia, will be a safe place. In the reading, these turmoils sound like they will be produced by Earth-changes, but they could be due to strife between capital and labor, or to other factors like racial hatreds. What is the current evidence for impending food-supply problems? As most of us already know, scientists have concluded that 1998 was the warmest year of not only the 1990s decade, but quite possibly, of the last millennium. And 2001 was the warmest year worldwide since temperatures have been recorded. Just last week, the British Meteorological Office at Hadley issued a report that Phylos could have written. It said that the first three months of this year were the warmest globally since records began in 1860. In North America, agriculturally productive ground is drying out. Drought has gained a foothold in both the eastern and western parts of America. Prof. D. Stahle, a climate specialist who has studied the epic 16th century drought that severely impacted North America, has reminded us that, drought is the most severe natural disaster. "Year-in and year-out, over the long haul, drought extracts the most from humanity. If there's any lesson to be taken home from the paleo-record, it's that need to conserve our water resources," Stahle says. "It would help prepare us for the inevitable return of the drought." Fig. 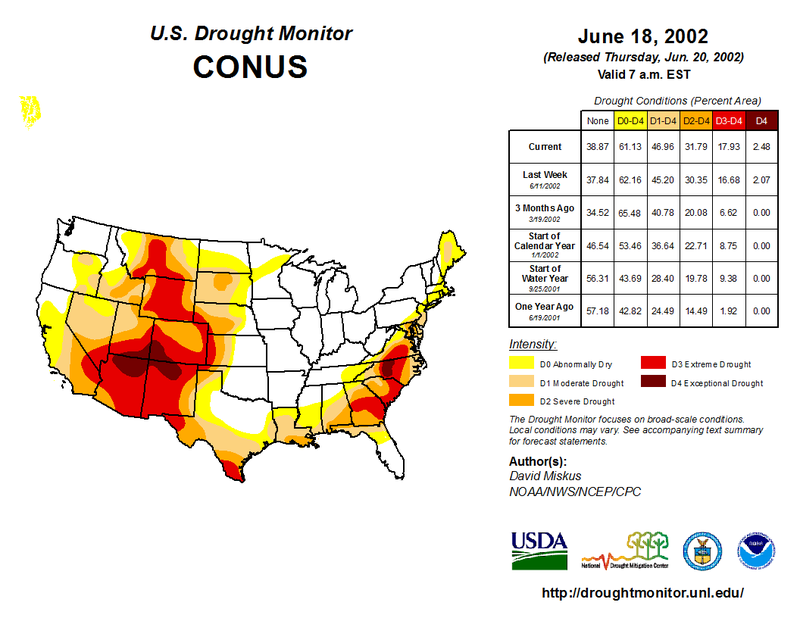 3 - Map Showing America's Drought Areas. In Montana, as farmers survey wheat fields of dust and ranchers walk through pastures grazed to the nubs, difficult choices are being made. Some have sold out, purging cattle herds built up over generations. In Canada, a huge swath of land from Hudson Bay, Saskatchewan, in the northeast, to Pincher Creek Alberta, in the southwest suffered through 2001 in what was called the driest year ever. In many parts of Saskatchewan and Alberta rain and snow was less than average for the past five years. Between the heat, the sun and the wind, soil moisture is almost nil. 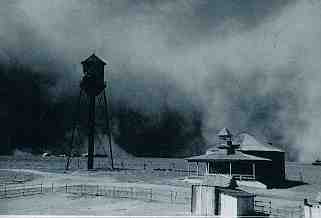 Bob Cormier, a weather analyst with Environment Canada, said that in some places like Saskatoon, Kindersley, and Coronation, Alta., 2001 was the driest on record. He said it was made worse because in many areas it was the fifth consecutive dry year. While Cormier knows what has happened to the weather he has no idea why it's been so dry for so long. But the water crisis is worldwide. According to the International Water Management Institute, over 300 large cities already have serious water shortages. Almost one-third of the world's population will live in regions facing severe water scarcity by 2025. Asia and sub-Saharan Africa will be the most severely affected regions. Wars will soon be fought over water, as they have in the past been fought over oil. Even if the current conflict between the Israelis and Arabs is resolved tomorrow, in 10 years or less the area is likely to explode over water -- unless regional planning is implemented soon. According to Lester Brown, the Chinese are now faced with the prospect of massive eastward migration into the large cities. This is due to the fact that 900 square miles of land is turning to desert in China every year. "There are too many people, too many cattle and sheep, and too many ploughs," he says. As for plagues, need we be reminded of the recent "mad cow" (BSE) and foot-and-mouth diseases plaguing Europe, and the current chronic wasting disease now plaguing North American deer and elk? Are we not also experiencing a worldwide AIDS plague, now killing humankind with increasing fury in Asia, Africa, and Russia? Whooping cough is making a global comeback in people of all age groups. So much for the terrestrial animal world. As for marine life, the coral reefs of the southwestern Pacific, including the Great Barrier Reef, are on a fast track to extermination. On land, USA Today's John Ritter reported last month that a mysterious new fungus destroying California oaks has been found on a widening list of trees. Lab tests have already confirmed that the Sudden Oak Death pathogen kills northern red oak, the dominant hardwood in the U.S. timber industry. This fungus may threaten all of the trees in North America. As for the exceedingly great earthquake referred to by Phylos, we think that it might coincide with the beginning of shift as described in Cayce reading 826-8. The Earth will certainly quake everywhere if the north pole suddenly starts to continue its seven-year-delayed movement down our proposed path along roughly the 60-degree W meridian. More on this subject soon. We are somewhere in the transition from one cycle to the next. And we've come once again to an old question. Are the Earth changes spoken of in the Cayce readings to be understood allegorically or factually? Can we experience them exoterically (outwardly) or esoterically (inwardly)? If, as Phylos says, "nature follows man" in his currently downward course, then mankind might expect to experience the Earth changes -- and understand them -- both ways. This seems true insofar as reading 281-31 is concerned. It states that almost all portions of Scripture may be interpreted on literal, spiritual, and metaphysical levels, "especially of the Revelation as given by John." In giving the interpretation of this particular portion of the Revelation, it must all be kept in mind that, as has been indicated, while many of the references - or all - refer to the physical body as the pattern, there is that as may be said to be the literal and the spiritual and the metaphysical interpretation of almost all portions of the Scripture, and especially of the Revelation as given by John. Yes, there is in fact a great deal to be concerned about in this time of transition between cycles. Where does hope lie? Here is a passage from Cayce reading 3976-15, given in January 1934 that describes both the larger situation in which we find ourselves and addresses the matter of a way out. As to those things that deal with the mental of the Earth, these shall call upon the mountains to cover many As ye have seen those in lowly places raised to those of power in the political, in the machinery of nations' activities, so shall ye see those in high places reduced and calling on the waters of darkness to cover them. And those that in the inmost recesses of themselves awaken to the spiritual truths that are to be given, and those places that have acted in the capacity of teachers among men, the rottenness of those that have ministered in places will be brought to light, and turmoils and strifes shall enter. And as there is the wavering of those that would enter as emissaries, as teachers, from the throne of life, the throne of light the throne of immortality, and wage war in the air with those of darkness, then know ye the Armageddon is at hand. For with the great numbers of the gathering of the hosts of those that have hindered and would make for man and his weaknesses stumbling blocks, they shall wage war with the spirits of light that come into the Earth for this awakening; that have been and are being called by those of the sons of men into the service of the living God. For He, as ye have been told, is not the God of the dead, not the God of those that have forsaken Him, but those that love His associations among men -- the God of the LIVING, the God of Life! For, He IS Life. What Can We Do About Ourselves At This Overlap Of Cycles? Isn't it interesting how we confront every upsetting problem by asking what we can DO about it? It would seem well to reflect that we can not DO beyond our level of Being. This is so because one's level of Being will always make one do what one has always done. In a Work sense (see below), this is not doing because it is mechanical. What we do mechanically according to our level of Being is not doing. We may think we are doing, but it is our machine that is doing. To do in a Work-sense is to go against mechanical doing. At the same time it is possible to experience beyond our level of Being and this can carry us forward. Why must we work on our level of Being? Because when we lay our body of flesh and bones aside we can take nothing with us but our psychology. Then, we become our psychology. If we hate, we find ourselves in hatred, along with all those who similarly hate. Now this hate comes from the self-love that has been offended or slighted or made fun of. There is an enormous amount of hate in the world today. Hate makes people sub-human in behavior, as we have increasingly witnessed in recent days, months, and years. Thus, to begin to grasp what one is psychologically, one should ask frequently what his or her relationship is to the good of the work one is following. By Work, I mean a practical, higher teaching that has been sown amongst humanity by benevolent sources on a higher level. Examples would be teachings like those followed by the Search for God study-groups; by those following the Gurdjieff-Ouspensky system as taught by Maurice Nicoll; by those following true Sufi Work materials, as promulgated by the Society For Sufi Studies in Los Altos, CA; and the esoteric Work teachings and study activities carried on by various religious groups. What is our relation to such Work, to its good and to its truth? One means here one's inner, or real relation, not what one's False Personality (also called Commanding Self) displays or imagines. What inward deficiency has one discovered within oneself by careful self-observation? What is one's Work aim? When people secretly feel that they are doing a kindness to the Work they follow by associating themselves with it, they have no inner relationship to that Work and are actually in psychological danger. A man or a woman must truly want the Work more than the present state of their lives to begin to have an inner relation to it. One must, therefore, be careful never to patronize one's Work, either inwardly or outwardly. To connect one's Work with the personal self love is to value oneself more than one's Work. Do we suppose that we can think clearly about our Work when our self-love secretly detests it? Our thoughts will not take it in. Now in regard to the above we can quote from a remark made by Paul in his second letter to Timothy. It sounds as though Paul is speaking about what happens when self-love meets inner truth, although he is referring to the end of the cycle under whose influence we are now living. Paul mentions various signs and symptoms of the general breakup of all good and truth and the rise of evil, deception, and falsity. Among other things he says, “For men shall be lovers of their own selves....ever learning and never able to come to the knowledge of the truth.” (II Timothy 3:2 and 7). Here we see why they cannot perceive truth for themselves. The self-love fights against the truth of the Work. It is the self-love that seeks to keep a man or a woman asleep. All aspects of the self-love can torment us and make us suffer. Our lives become spoiled. Therefore, we must observe over and over again - in the gentlest way possible toward ourselves - our self-love, and bring it into our conscious perception and acknowledge it. This steadily diminishes our love of self. And we will find that the Work will be able to nourish us. The foregoing material fits well with the following portion of reading 5757-1 that was cited earlier. The more ye become aware of thy relationships to the universe and those influences that control same, the greater thy ability to help, to aid, - the greater thy ability to rely upon the God-force within; but STILL greater thy RESPONSIBILITY to thy fellow men. For as ye do it unto the least, ye do it unto thy Maker, - even as to the Sun which reflects those turmoils that arise within thee; even as the earthquake, even as the wars and hates, even as the influences in thy life day by day. Then, what are sunspots? A natural consequence of that turmoil which the sons of God in the earth reflect upon same [the Sun]. Thus they [sunspots] oft bring confusion to those who become aware of same. Let not your hearts be troubled; yet believe in God. Then just act like it - to others. Is there a way to test the statement about sunspots being "a natural consequence of that turmoil which the sons of God in the Earth reflect upon same" [the Sun]. Perhaps the highly documented, horribly cruel events of WWII might be investigated as causative agents in sunspot formation. The year 1945 affords a useful opportunity, around the time of the dropping of atom bombs on Hiroshima (August 6th) and Nagasaki (August 9th), for a mini-test of the relationship between intense turmoil in human minds on Earth and sunspot formation. The date (1945, August 9), and the number of sunspots observed (30), on this particular line are shown in red to highlight the relevant column locations that we are interested in. I then went to the table, for all days in August 1945, and noted the number of sunspots recorded. Here is a graph of the sunspot numbers and dates of bomb drops. The following twelve "items" on various governments' preparations for war were e-mailed to me on 4/30/2002 by Bruce Beach, who has an excellent website on nuclear war fallout shelter survival information. I quote the relevant contents of Bruce's e-mail. Together, the twelve accounts indicate the magnitude of the groundwork that is being laid for global conflict and the items fit with Phylos's vision. "Nuclear weapons are back on the front pages, with news of a Bush administration policy document, the U.S. Nuclear Posture Review, which projects the role of nuclear weapons into the future -- not as deterrents, but for the purpose of waging wars. The document even names potential targets. This document and the thinking behind it are reckless. They not only jeopardize international law but the support of America's closest allies. CANADA MUST STATE ITS OPPOSITION IMMEDIATELY (emphasis mine)." "There are still 31,000 nuclear weapons in the world, most of them American or Russian, with lesser amounts held by the United Kingdom, France and China, India, Pakistan and Israel. At least 5,000 of the U.S. and Russian nuclear weapons are maintained on hair-trigger alert, meaning they could be fired on 15 minutes notice." Yep, 15 minutes before the train gate comes down. It could all start that soon. But do notice - the Canadians are not in favor of going for the ride. Author of the article is: Douglas Roche an independent senator from Alberta and Canada's former ambassador for disarmament. He is a former chairman of the UN Disarmament Committee. "The Bush administration has dramatically escalated its campaign of global intimidation by going public with portions of the Pentagon's latest classified plans for the use of nuclear weapons and its targeting of China, Russia, the Democratic People's Republic of Korea, Iran, Iraq, Syria and Libya with these weapons." "Starting in April, research is to begin on fitting an existing nuclear warhead into a new, 5,000-pound earth- penetrating bomb." if the People's Republic of China was at war with Taiwan." U.S. Works Up Plan for Using Nuclear Arms Administration, in a secret report, calls for a strategy against at least seven nations: China, Russia, Iraq, Iran, North Korea, Libya and Syria. The Bush administration has directed the military to prepare contingency plans to use nuclear weapons against at least seven countries and to build smaller nuclear weapons for use in certain battlefield situations, according to a classified Pentagon report obtained by the Los Angeles Times. The secret report, which was provided to Congress on Jan. 8, says the Pentagon needs to be prepared to use nuclear weapons against China, Russia, Iraq, North Korea, Iran, Libya and Syria. It says the weapons could be used in three types of situations: against targets able to withstand non-nuclear attack; in retaliation for attack with nuclear, biological or chemical weapons; or "in the event of surprising military developments." puts forth chilling new contingencies for nuclear war. "...the Bush administration plan reverses an almost two-decade-long trend of relegating nuclear weapons to the category of weapons of last resort. It also redefines nuclear requirements in hurried post-Sept. 11 terms." "Planning nuclear-strike capabilities, it (the US) says, involves the recognition of "immediate, potential or unexpected" contingencies. North Korea, Iraq, Iran, Syria and Libya are named as "countries that could be involved" in all three kinds of threat. "All have long-standing hostility towards the United States and its security partners. All sponsor or harbor terrorists, and have active WMD [weapons of mass destruction] and missile programs." William M. Arkin is a senior fellow at the Johns Hopkins University School of Advanced International Studies in Washington and an adjunct professor at the U.S. Air Force School of Advanced Airpower Studies. He a regular contributor to the Bulletin of the Atomic Scientists. This one from a foreign press - and showing it is not just the US that is preparing to do the nuclear dance. "Britain is ready to use its nuclear arsenal against any rogue state which deploys chemical or biological weapons on UK troops, Geoff Hoon, the Defence Secretary, warned yesterday. [20 March 2002]"
"With between 200 and 500 thermonuclear weapons and a sophisticated delivery system, Israel has quietly supplanted Britain as the World's 5th Largest nuclear power, and may currently rival France and China in the size and sophistication of its nuclear arsenal." "Britain risks being dragged towards development and potential first strike use of tailor-made nuclear "bunker-buster" weapons on the coat-tails of an increasingly aggressive US military stance..."
"The 82-page study, drawn up by the British American Security Information Council..."
"The Basic report sees this as "a collision course", "The (British) Trident boats ... (have) 48 nuclear warheads which make up the usual patrol payload." "The climate for conflict has intensified, with the struggle between Pakistan and India, the China-Taiwan tug of war, and the increased bloodshed between Israel and the Palestinians." "United States' troop deployments in the Philippines, Yemen, Georgia, Columbia and Indonesia create new possibilities for expanded war. An invasion of Iraq is planned. The recent disclosure that Russia, China, Iraq, Iran, Syria, North Korea, and Libya are considered by the United States as possible targets for nuclear attack catalyzes potential conflicts everywhere." Assumes that the United States has the right to launch a pre-emptive nuclear strike. Equates nuclear weapons with conventional weapons. Attempts to minimize the consequences of the use of nuclear weapons. Promotes nuclear response to a chemical or biological attack." "These missiles are 7 minutes flight-time from Taiwan," said a second intelligence official." "China in 1996 had fewer than 50 short-range missiles within striking distance of Taiwan. Today, U.S. intelligence estimates that China's military forces have more than 350 missiles in the region." "Adm. Blair said the missile buildup is worrying The Pentagon recently updated its war planning should U.S. forces be called upon to defend Taiwan from an attack by the mainland. The upgrade followed statements by Mr. Bush last year that the United States would do "whatever it takes" to defend Taiwan." "China and Russia are planning to hold joint military exercises for the first time in more than 30 years, a report said yesterday." "The drills, which will take place sometime in August, will involve all three branches of the armed forces from both countries, according to a report on Taiwan's ETtoday.com website." "Separately, in Moscow, Russian Premier Mikhail Kasyanov told visiting Chinese Foreign Minister Tang Jiaxuan that high-level contacts between the two countries had been 'very frequent' and that these contacts would culminate with the visit of Russian President Vladimir Putin to China later this year for talks with Chinese President Jiang Zemin." "Mr Kasyanov said an upcoming meeting between the Russian and Chinese premiers would boost economic cooperation, the official Xinhua news agency reported." "The US, worried by China's missile build-up opposite Taiwan, is pushing ahead with plans to boost its forces in the region, according to the Pentagon's top policymaker on East Asia, who restated the George W. Bush administration's commitment to the defense of Taiwan." "Peter Brookes, a deputy assistant secretary of defense, made the remarks in an address, entitled "US Presence in the Asia-Pacific Region: An Enduring Commitment," to a closed door meeting in Florida..."
"We are exploring options to homeport three to four additional surface combatants in the region, as well as guided-missile submarines to improve our forward deterrent posture," Brookes said, without specifying where the additional vessels might be based." "WASHINGTON, April 27 - The Bush administration, in developing a potential approach for toppling President Saddam Hussein of Iraq, is concentrating its attention on a major air campaign and ground invasion, with initial estimates contemplating the use of 70,000 to 250,000 troops." "The administration is turning to that approach after concluding that a coup in Iraq would be unlikely to succeed and that a proxy battle using local forces there would be insufficient to bring a change in power." "But senior officials now acknowledge that any offensive would probably be delayed until early next year, allowing time to create the right military, economic and diplomatic conditions. These include avoiding summer combat in bulky chemical suits, preparing for a global oil price shock, and waiting until there is progress toward ending the Israeli-Palestinian conflict." "The planning now anticipates the possible extensive use of bases for American forces in Turkey and Kuwait, with Qatar as the replacement for the sophisticated air operations center in Saudi Arabia, and with Oman and Bahrain playing important roles." "The president has not made any decisions," a senior Defense Department official said. "But any efforts against Iraq will not look like what we did in Afghanistan." As intense and capable as the US nuclear build up is, it is quite possible that the Russian build up is even more intense and equally capable. Indeed, the Russians have a weapon in the Topol-M beyond anything known for the Americans, as well as some more advanced sea missiles and other capabilities. But, not to worry, the US has enough capability to blow up the whole world on its own. And then in all this - I did not mention Pakistan, India, North Korea, nor China - statement that their missile will eliminate Los Angeles if the US interferes with Taiwan. Nor the fact that this week Russian nuclear bombers flew within 30 miles of the US - something that hasn't happened in a very long time. For forty years I have seen the danger, but in forty years I have never seen it so dangerous.